All summer Bob Marley has been singing to me. “Jammin, jammin, jammin.” First it was (the first batch of) strawberry jam. “Yea, I hope dis jammin’ gonna last.” I made lemon verbena-strawberry preserves, lavender-strawberry preserves, and just plain strawberry, but with the first flat of strawberries I only came up with twelve jars of mixed pints and half pints. For a family who eats jam at a reasonable pace, this would probably suffice for the next twelve months. Not for us. If a week goes by without finishing an entire pint of jam, someone must be out-of-town or extremely ill. We spoon it into yogurt, spread it onto homemade crumpets and multigrain toast, churn it into homemade frozen yogurt, spread it as a base layer in a custard-fruit tart, and generally swoon over the flavor of fresh fruit preserves with very little sugar on a daily basis. Aside from the strawberry with extra herbal flavorings, I have actually been leaning in the opposite direction. I can always open a jar of jam and fancy it up based on whether I am serving it on a cheese plate, atop a frangipane tart, or dolloping some into ebelskivers for a lazy Sunday morning breakfast. Lately, my ultimate goal in making jams/preserves, has been preserving the juicy summer fruits in their closest redaction to the fresh fruit itself. For example, eating a red-tinged dripping yellow peach over the sink. 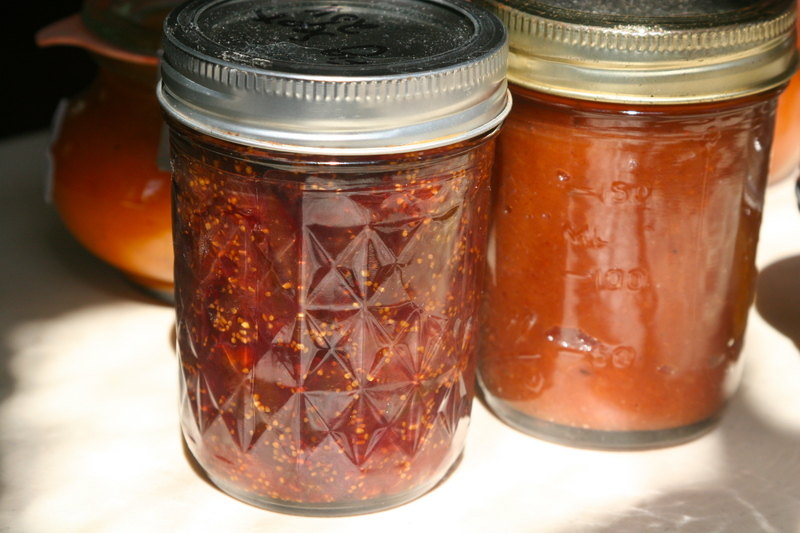 Not plum jam with pineapple sage or Pinot noir strawberry–just fruit and a little sugar cooked minimally (with the exception of the apple butter). Aside from a couple more batches of strawberry, I made cherry, peach, apricot cooked with their crushed pits in a cheese cloth, pluot, two different types of wild plum preserves, apple butter, wild blackberry, fig, and the ugliest (but tastiest) yellow raspberry preserves you’ve ever seen. My kids tussle over who gets to go pick the next jar (of the over 200 jars) from the pantry every time. A couple of months ago, my mom’s best friend emailed me wondering if I had heard of a non-butter (basically, healthier) scone that still had a hard, non bready texture. The short answer is no. I have not encountered a non-fat scone that actually still tastes like a scone. However, I have to admit that my paranormal scone obsession had me concocting ways to make a tasty scone that was “healthier” as I deemed it. 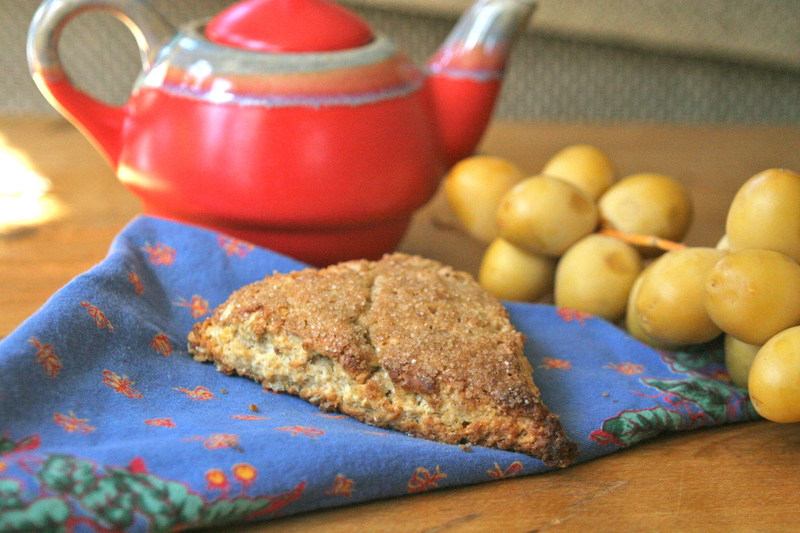 Just like the jams this summer, however, lately I have been tending towards a simpler scone. 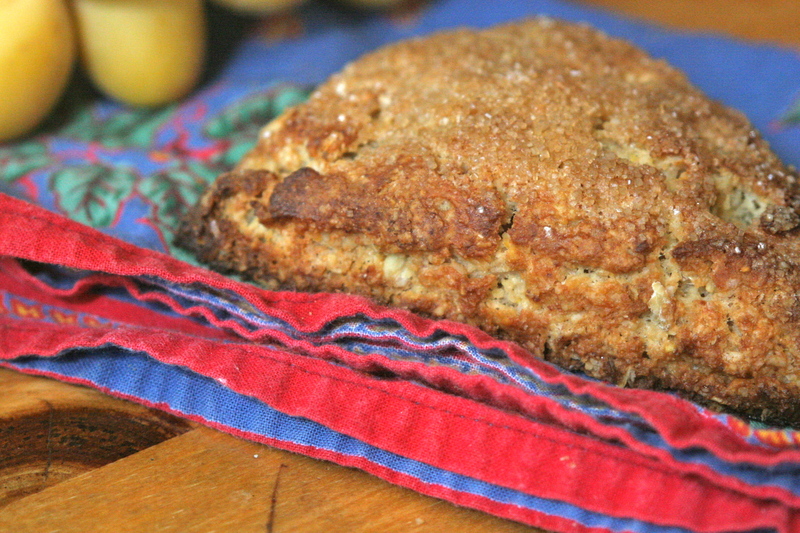 I still very much enjoy ginger scones, peach and berry scones, and especially Sandbox Bakery‘s sour cherry almond scone, but at home I was searching for a scone that highlighted the grains and flour with whatever extra fruit flavorings I craved on the side. For this recipe, I decided to lower the butter just a bit. In truth, I found no difference in these scones from a higher-fat scone in its fantastic dense pockets contrasted with light flakiness. I opted for a combination of all-purpose and barley flours studded with multigrain cereal and rolled oats. Instead of cream I used buttermilk, and to be completely honest, it was the quicky homemade kind this time (milk with a couple of tablespoons of apple cider vinegar). The result? Warm and slightly dense in some areas, while crunchy in the corners and wherever you bite into a larger piece of the multigrain cereal. I could not resist brushing a little milk and sprinkling some natural washed sugar (demerara or muscovado would be incredible too) over the tops before baking them and was so happy I did. They are crazy addictive. The creamy and sweet flavor of the barley flour comes out beautifully with the oats and the mixed grains. The scone itself has so little sugar that it is not too sweet–a perfect accompaniment for your favorite apricot, fig, or plum jam. This is my new favorite scone, hands down. If you are feeling a hankering for add-ins, do it at the last second before patting the dough together and cutting the scones. 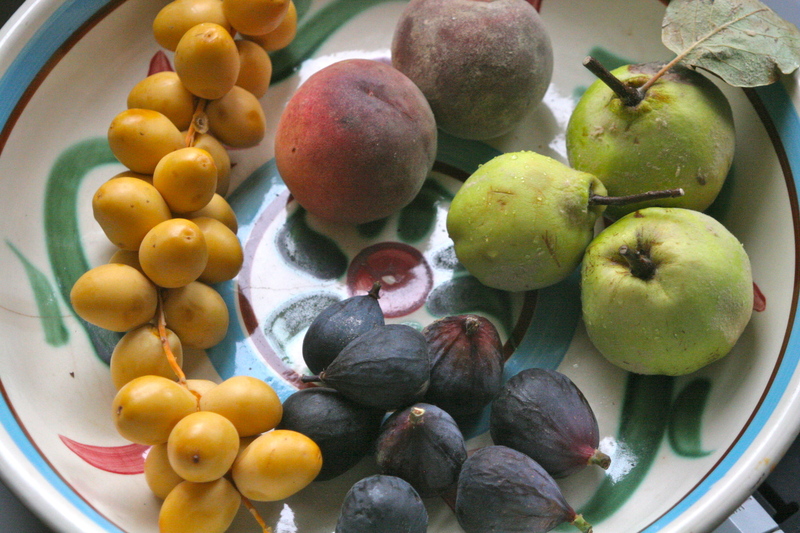 Here are some jam-making tips for seizing the last of summer fruit. Peach preserves? This recipe for cherry preserves works well for almost all stone fruits and strawberry preserves. Finally, I have mentioned it before, but I love Liana Krissof’s canning book for tips. Feel free to send me a note if you have a specific question about a fruit you want to turn into jam. Last, but not least, if you are not a jam person, these taste pretty amazing with just-picked new dates. They are available now at many California farmer’s markets and they are absolutely delicious alongside the scones and with your favorite cup of tea. Preheat the oven to 400F degrees. Combine the soured milk or buttermilk with the multigrain cereal and let it sit for 10 minutes to absorb the milk. 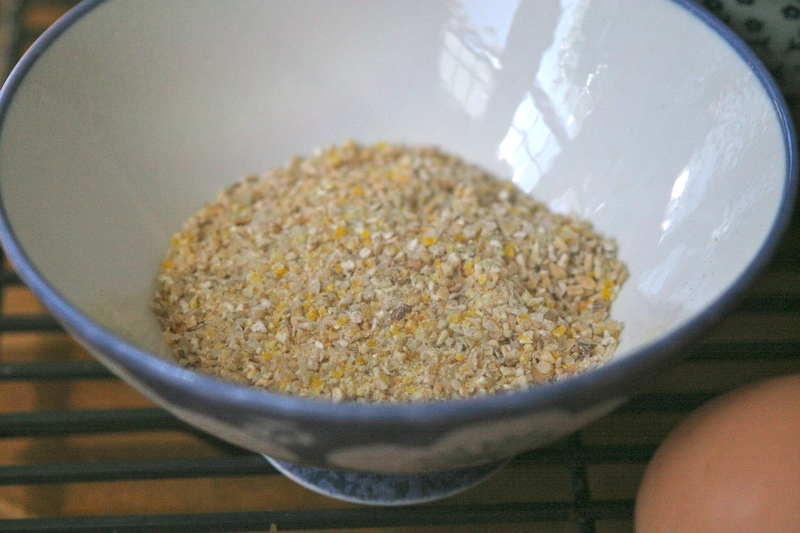 Meanwhile, combine the rest of the dry ingredients (oats, barley flour, a.p. flour, brown sugar, baking powder, salt) and whisk in a bowl. Add the tiny cubes of cold butter and mix in with a pastry blender or two forks for a minute or two until little pea size clumps appear. Lightly beat the egg with the vanilla and the buttermilk-multigrain cereal mixture and then carefully incorporate all of it into the bowl of dry ingredients and butter. I use a fork until it becomes a rough mass. Sprinkle some oats and a little dusting of flour on a clean surface and dump the dough out. 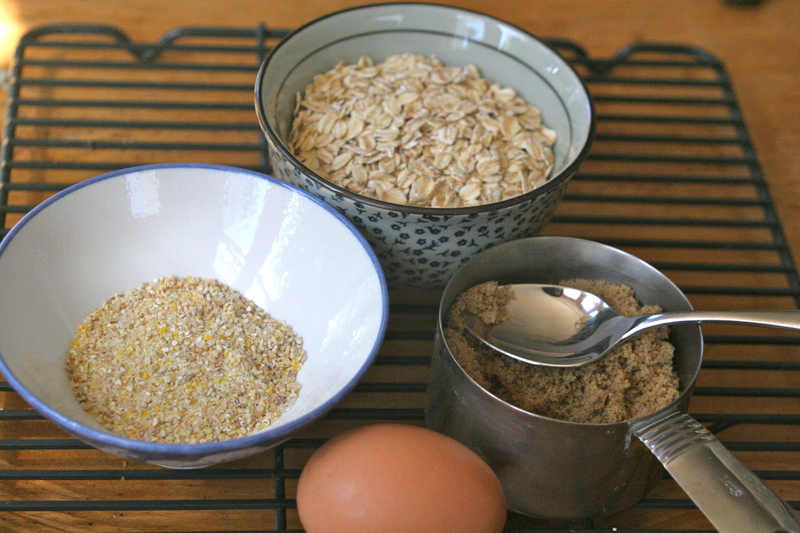 Push the dough together with your hands until it is a rough ball and roll it in the oat mixture. Knead it twice or thrice until a definite mass. Pat the dough into a dish that is 1/2-3/4 inch high and cut into 8 wedges and place on a baking sheet. Brush the top of each with some milk and sprinkle with the sugar of your choice. Bake for 15 minutes or until the scones are golden brown (slightly darker than you would let a cookie go). This entry was posted in Breads, Breakfast, Jams & Preserves, Jams and Preserves, Whole Grains and tagged barley flour scone, barley flour scone recipe with multigrain cereal, barley oat scone recipe, jam and scones, multigrain scone recipe, new dates with scones, Scone base recipe. Bookmark the permalink. Can’t wait to give this a try. Beautiful, I wish I could just reach through the screen and grab one!!! So glad! I hope they resemble what you were thinking of. And if you make them into 8, you only have about 5 grams of fat in each one (assuming that each one has about 2 teaspoons of butter incorporated, and tons of fiber from the grains and the barley flour. XO! P.S. Congratulations to Spencer and Kat! Hooray! AM, these look fantastic. I’ve been wondering if you would post some other top-tier breakfast creation. The popovers are now a regular Saturday morning tradition over here, and I may just try the scones on Sunday. I have no idea how you do it, jamming, and mommying, and all. Hugs. AM, these look fantastically delicious. I’ve been wondering if you would post some other top-tier breakfast creation. The popovers are now a regular Saturday morning tradition over here, and I may just try the scones on Sunday. I have no idea how you do it, jamming, and mommying, and all. Hugs. Wow! 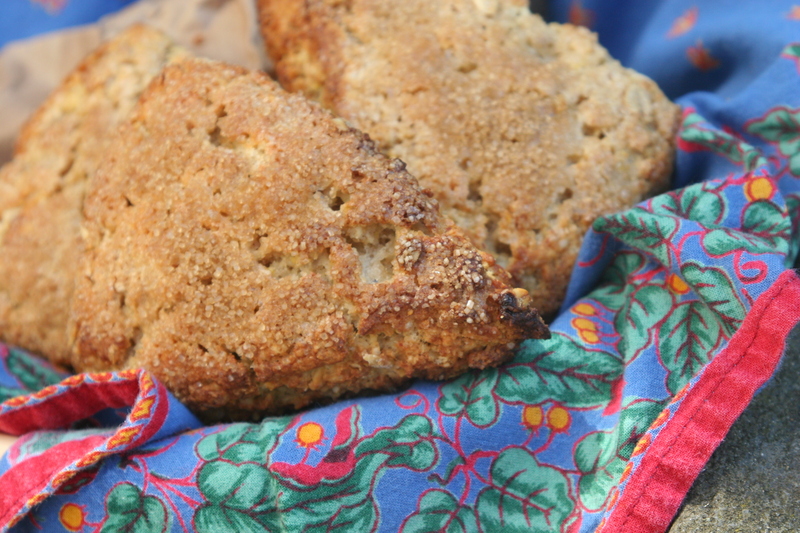 These scones sound and look beyond tasty. Can’t wait to try a batch. ALSO, I’ve been unable (rather, too busy/lazy) to get to Alemany the past couple of weeks—you’ve just supplied the extra bit of motivation I need to make it happen! 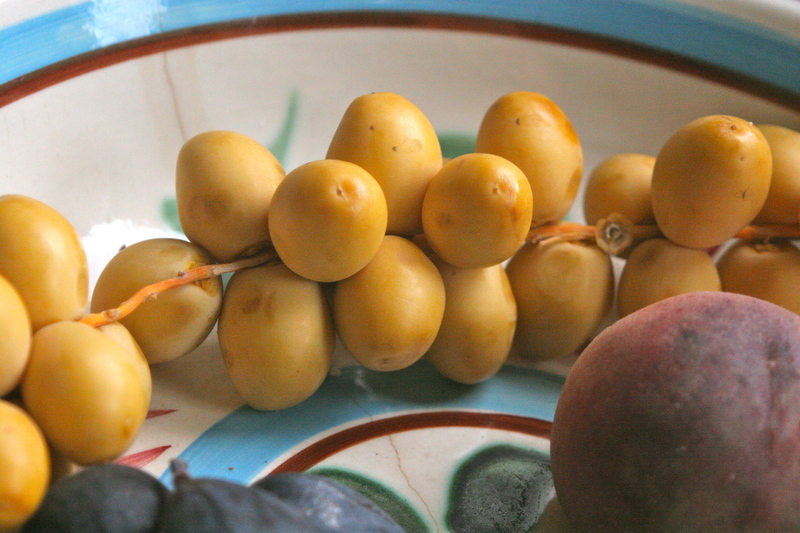 End-of-summer fruits, watch out! I’m coming for you! I have been craving these again. We just opened one of the wild plum jams this morning and I think it would be amazing with the scones. If I make some, I’ll save you a couple. 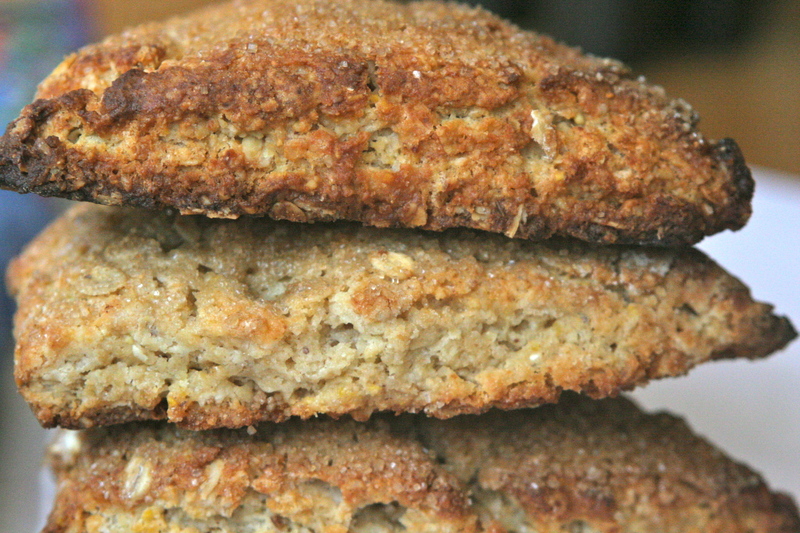 I’ve been looking for a yummy replication of a multigrain scone here in Venice, CA at a bakery. These look like they might do the trick and I’m anxious to give them a go. I know this is almost a year old post, but I’ve just stumbled upon your site. I too love making up large batches of the season’s ripest fruits and this year the white nectarines are so full of sugar. You said “tussle”. Made me smile. Thanks for the comment Janet. 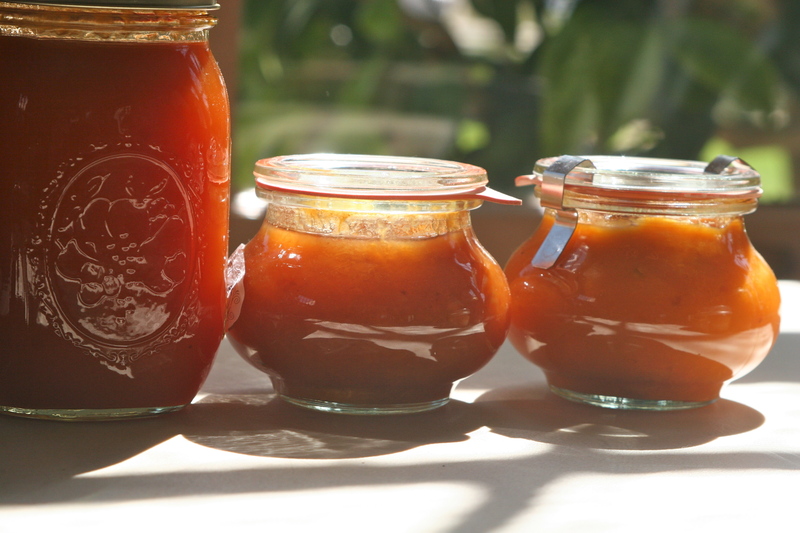 How did the nectarine jam go?